Most leaders fail at the pinnacle of their influence, not because of a lack of leadership skills but rather due to character flaws. It's character - not years of experience - that counts for lasting leadership impact. Servanthood: Are You a Servant Who Leads or a Leader Who Serves? Drawing from more than thirty years of discipling and mentoring emerging leaders with The Navigators, author Tom Yeakley has written this hands-on tool to equip current leaders, especially young leaders, to intentionally develop positive character traits for sustainable leadership influence. Yeakley's discipleship philosophy is based upon a leadership "triangle". At the base of that triangle are foundational character qualities (love, integrity, humility, and servanthood). Then the supporting qualities of faith, patience, purity, self-control, teachability, and courage build upon those foundational character qualities. After establishing these clear character qualities, one can work on developing skills and abilities that allow leaders to lead with godliness and integrity. Each section has scripture references, stories and examples to define each quality. Once the quality is defined, there are sections for Bible study, scripture memory, guided prayer and practical development exercises. What do we look for in a potential leader in the church? Do we seek people with skills and abilities that will benefit our congregation? Do we invest power and leadership authority in someone who has financial resources to benefit our institution? Or do we simply seek a warm body to fill a leadership position that it was preordained that our congregation needed to have? 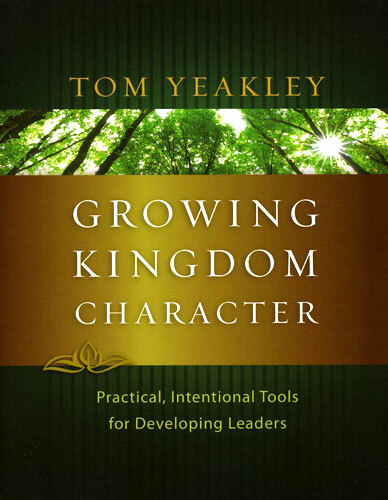 Tom Yeakley argues that biblical leadership begins with godly character. 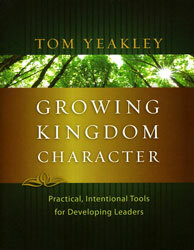 In Growing Kingdom Character Yeakley creates a resource to develop Christian character in potential Christian leaders. Growing Kingdom Character is a thorough, well-thought-out curriculum book that has the potential to be a great support for churches and Christian organizations of all sizes. Yeakley's discipleship philosophy is based upon a leadership "triangle" (20-21). At the base of that triangle are foundational character qualities (love, integrity, humility, and servanthood). Then the supporting qualities of faith, patience, purity, self-control, teachability, and courage build upon those foundational character qualities. After establishing these clear character qualities, one can work on developing skills and abilities that allow leaders to lead with godliness and integrity. Each chapter in Growing Kingdom Character has a text, a Bible study, a prayer guide, and some exercises to help each participant in the study build kingdom character into their lives. The text is brief enough for a weekly study. The Bible study is thorough and will take considerable effort for participants to read through. The prayer and exercises are well done, and offer a lot of opportunity for growth and discussion as well. I found Yeakley's book refreshing. When one looks at the qualifications for leaders in the Pastoral Epistles, most of the job descriptions have to do with character qualities and not leadership skills. Our society tends to value image over substance, and many times churches have followed society's standards. Growing Kingdom Character provides a prophetic challenge in this context.